Nathaniel stamped his class on a top-quality field to take the Grade 1 Coral-Eclipse at Sandown on July 7. Never quite given due credit for winning what was widely considered an unsatisfactory King George last summer, the colt had suffered an interrupted preparation in the early parts of this year and John Gosden had been playing down his chances on his first start since October. The Newmarket trainer has barely been more dominant in his long career and has the assistance of a jockey sitting on the crest of the same wave in William Buick, but it still required a giant effort from Nathaniel (7-2) as he refused to relinquish his lead to the 11-4 favourite Farhh in a thrilling final-furlong battle. Nathaniel got as close to the incredible Frankel as any horse has managed so far when beaten just half a length in a now-memorable Newmarket maiden in August 2010 and intriguingly, Gosden was not averse to another clash and will bide his time before committing to a defence of the King George at Ascot on July 21. Nathaniel was completing a memorable day for owner Lady Rothschild, who had three Gosden-trained winners in the space of an hour including Great Heavens in the Lancashire Oaks, while the colt is named after one of the youngest members of the esteemed financial dynasty. Buick was evidently anxious to make the most of his mount's stamina over a mile and a quarter and once he had removed the threat of Farhh's pacemaker City Style, he had established a position in the lead with three furlongs remaining. Frankie Dettori was soon on the scene, not prepared for Farhh to be an apparently unlucky loser again as in the Prince Of Wales's Stakes at Royal Ascot, but whatever he threw at Buick was batted back up the home straight and he was resisted by half a length. Gosden said: "He's a super horse, but it has been very difficult to get him right as he has had a respiratory problem. It's two weeks to the King George and that's not great. He's put in a massive effort here, so we will just have to have a good think about whether we run again. Next week will tell us more. 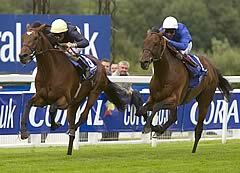 "It will be fun to take on Frankel once more, as there was only half a length between them in a maiden a long time ago. I love Frankel, and they are two lovely horses. The Juddmonte International would be an option, as would the Champion Stakes at the end of the year." Buick, who continues to look like a champion jockey in the making, said: "He's a horse that put me on the map last year and he has repaid me again, but you have to say that was a fantastic training performance from John Gosden. To get the horse here in the shape he was in, all credit to John." Farhh ran a superb race to come home second, beaten a half-length by Nathaniel, in the 10-furlong Group One Coral-Eclipse at Sandown Park on Saturday, July 7. The four-year-old Pivotal colt broke well and was held up eighth of the nine runners by Frankie Dettori. He moved up to sixth turning into the straight and was switched out to be able to deliver a challenge with three furlongs left. Farhh was asked to progress approaching the quarter-mile marker and ran on strongly to take second inside the final furlong. He pressed Nathaniel and at one point looked as though he would go into the lead, but the winner stayed on gamely to prevail in 2m 6.94s on good to soft turf. Saeed bin Suroor, Farhh’s trainer, commented: “He ran very well and was beaten by a better horse on the day - he tried really hard. "There are no plans but we'll keep him to the same distance for Group One races." 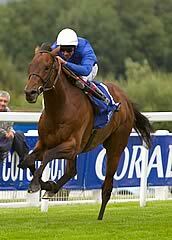 Frankie Dettori added: “Farhh did brilliantly. He came to beat a great field but Nathaniel pulled out all of the stops. When I got to Nathaniel, I thought that I had him but the winner’s stamina kicked in and he has outstayed us in the end. “It’s a stiff mile and a quarter at Sandown and the ground was a little bit on the slow side, which played to Nathaniel strengths and he proved to be a very tough horse.